William Dudley is president of the New York Fed and a former executive at Goldman Sachs. The Federal Reserve could be hitting the brakes on a rate hike in September. After fears that China's economic slowdown has worsened and global stock markets have nosedived, a rate hike appears "less compelling," said New York Fed President William Dudley on Wednesday. 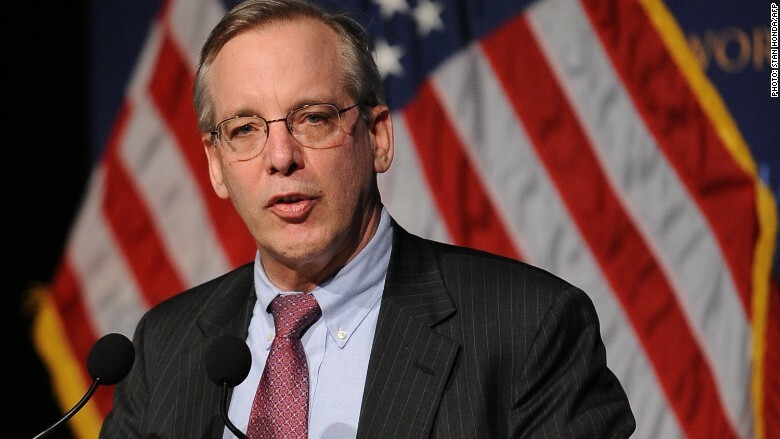 "The decision to begin the normalization process at the September [Fed committee] meeting seems less compelling to me than it was a few weeks ago," Dudley said at a press conference Wednesday in New York. Translation: A September rate hike is less likely now. The Fed hasn't increased its benchmark interest rate in nearly a decade. A rate hike would be considered a signal that the U.S. economy is healthy and is on its way to recovery from the recession. But China's slowdown is weighing on economies across the world. It's limiting growth in many countries and has led to turmoil in global stock markets and sent currencies plunging. It all could eventually curb economic growth in the U.S., which is what concerns the Fed. "What we're seeing is not about us...this is about developments abroad," says Dudley. Dudley did not clarify if he was looking to future Fed meetings in October through December to raise rates for the first time, often called "liftoff." He only indicated that a September rate hike appeared less likely in his view. All eyes will turn to Jackson Hole, Wyoming, Thursday through Saturday as some Fed policy makers, including Vice President Stanley Fischer, hold an annual meeting. Fischer is considered to be one of the Fed committee members most inclined to a rate hike. However, Dudley's comments dampen the prospects of the long awaited rate hike in September.